Helps with Heat Stress, Muscle Cramping, Low Electrolyte Levels. WITH 30mg of caffeine to boost mental awareness and reduce perceived effort. • The ONLY electrolyte capsule that was formulated to closely resemble the electrolyte profile lost during activity: sodium, potassium, calcium and magnesium. • Vegetable-based non-GMO capsule composition; Bio-available active ingredients. GMP production in a facility registered NSF Certified for Sport®. • Contains only WHAT YOU NEED. No: herbal, trace, questionable components added. Vegetarian and Gluten free. • Made in the USA — Free of banned substances and independently tested. Learn more about our manufacturing and safety. 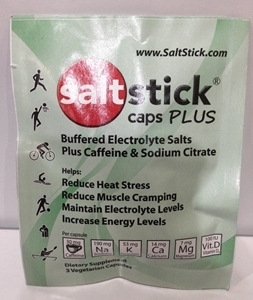 • Saltstick® Caps uniquely includes vitamin D that helps the body absorb and utilize calcium. • Great for effective rehydration during international travel, hiking and effects of alcohol and unfamiliar foods.